On Saturday April 2, 2016, ProQuest will be performing maintenance that will affect user authentication. The window is scheduled to begin at 10:00 PM BST and will last for eight (8) hours. Users attempting to access these products during the downtime will be re-directed to a web page explaining the scheduled maintenance. Across the weekend a diverse programme of cultural commemoration in the form of lectures, talks, concerts, exhibitions and re-enactments entertained and engaged the public. At the beginning of all these events was a laying of a wreath at the Garden of Remembrance at Parnell Square by President Higgins. The Garden of Remembrance was officially opened by then President of Ireland, Éamon De Valera, as part of the fiftieth anniversary commemorations of the 1916 Rising in 1966. As the events of 1916 are of such interest to study and understand, so too are the acts of commemoration and understanding how we remember these moments in Irish history at various times in the State's history. 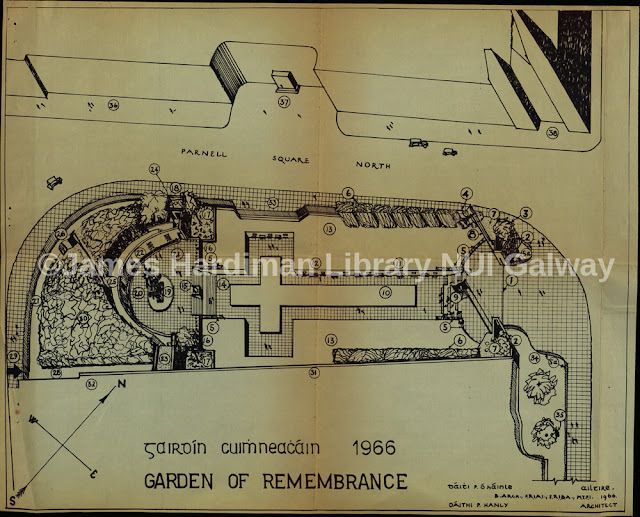 Within the archive of actor and revolutionary Arthur Shields at the Hardiman Library, NUI Galway, are original plans for the Garden of Remembrance. 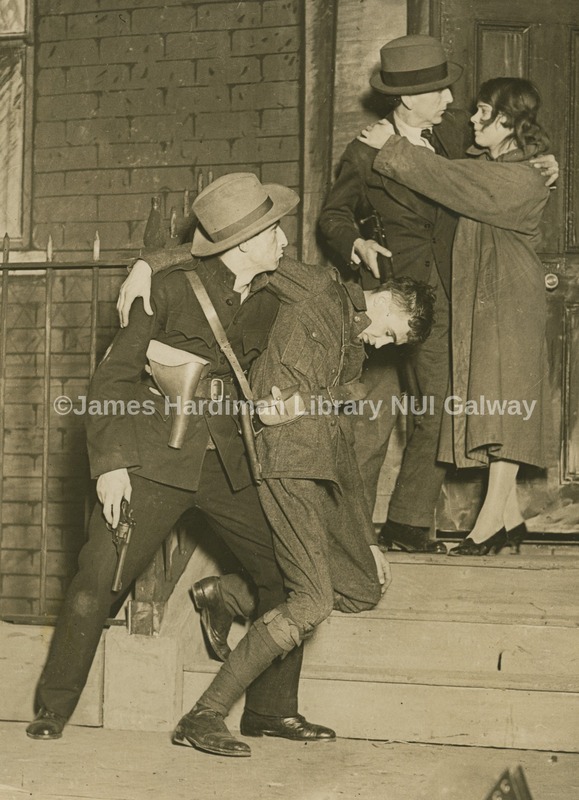 Arthur was an actor and stage manager at the Abbey Theatre and who was an active combatant in the Rising as it broke out just streets away from the Abbey Theatre. He was later arrested and interned at Frongoch Prison Camp in Wales. In a further link between history and remembering, Shields has the unique distinction of being a rebel active in 1916, of playing the lead role of Jack Clitheroe in the 1926 original production of Sean O'Casey's "The Plough and the Stars" critiquing the Rising at the Abbey Theatre and also playing the role of Padraic Pearse in the 1936 film version of "The Plough and the Stars" directed by John Ford with a screenplay by Dudley Nicholas. The below images are all from the archive of Arthur Shields and offer a glimpse into commemorations of 1916 fifty years ago. 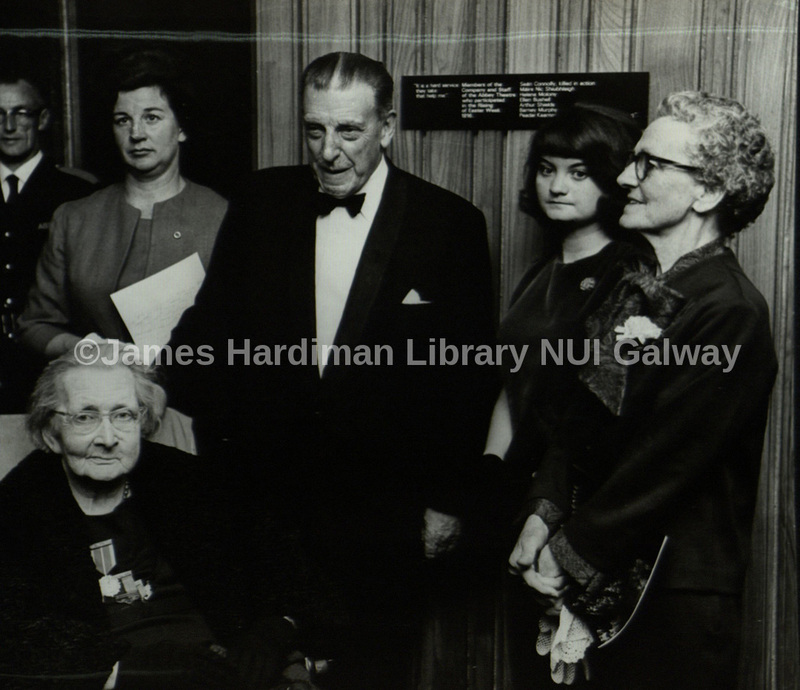 Photograph of an Taoiseach of the time, Sean Lemass (also a rebel involved in 1916 as a 16-year old) with Christine Shields and Helena Moloney (bottom left) on the occasion of the unveiling of a plaque to commemorate members of the cast and staff of the theatre who participated in the 1916 Rising, 1966. Helena Molony was a central figure in events in 1916 and also afterwards as a leading feminist, trade unionist and socialist. 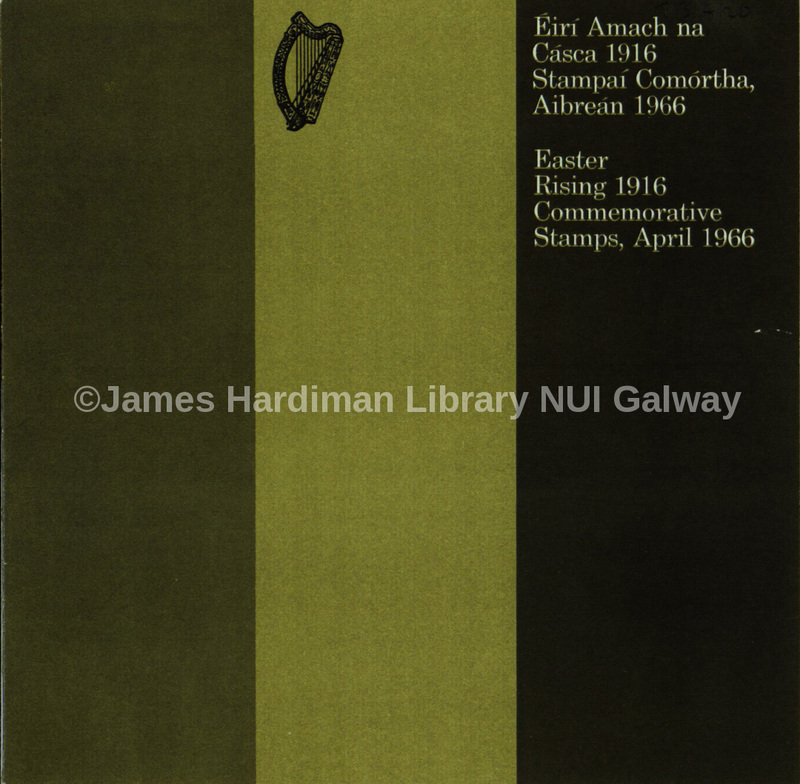 The Ossian Online project recently donated three Macpherson editions to the Special Collections section of the James Hardiman Library at NUI Galway. The donation includes copies of the first and second editions of Fingal (both dated 1762) and a copy of Temora (1763), and represents the beginning of an initiative to acquire copies of the seven editions that were published under James Macpherson’s authority in the period 1760-73. 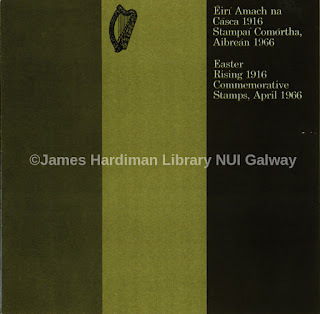 This will provide a printed analogue of the editions that comprise the focus of Ossian Online and create a new collection unique in the libraries of Ireland. 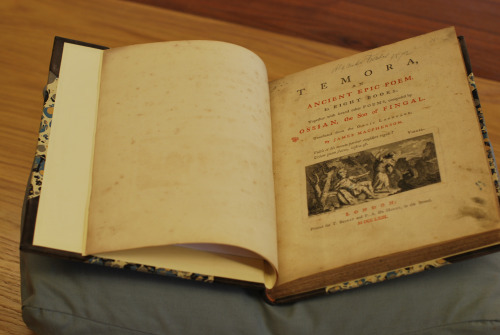 The edition of Temora donated to the James Hardiman library. While part of the motivation for Ossian Online is to make facsimiles and accurate transcriptions of the full Ossian corpus available on the web, the project recognises that this is a representation of—not a substitute for—the original print editions. Just as the digital medium enables new orientations towards literary texts—such as the platforms for visualising genetic textual development and collaborative annotation being developed by Ossian Online—the printed book offers opportunities for scholarship that are unique to that medium. Individual copies bear marks of ownership and use—bookplates, signatures, marginalia—that allow scholars to investigate the social history and provenance of the work. During the era of handpress printing, variations between individual copies within a single edition were common, and surveying multiple printed editions can unearth this evidence—and reveal the circumstances behind such phenomena—in a way that a representative digital facsimile cannot. Forthcoming posts on this blog will examine some bibliographical problems that arise from examining multiple printed copies of Ossian. Ossian Online team (Justin Tonra, Rebecca Barr, David Kelly) peruse Temora. 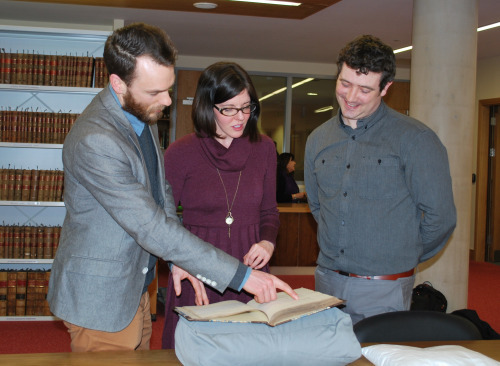 Thus, we are delighted to see NUI Galway take the first steps towards acquiring a printed collection to complement the work of Ossian Online. These editions were acquired with the assistance of funding from the School of Humanities at NUI Galway and the Irish Research Council, and the project would like to acknowledge their generosity in helping to establish this important initiative. Thanks also to John Cox, Librarian, and Marie Boran, Special Collections Librarian at the James Hardiman Library for their support in this endeavour. The Library Reading Room at basement level will be open as normal from 07.00 - 02.30 daily between Friday 25th - Monday 28th March. The James Hardiman Library will remain closed during this period. The Medical Library, at the Clinical Sciences Institute, will be open from 06.00-23.00 daily. Access is controlled by smart card and is available to all students registered on College of Medicine, Nursing & Health Sciences courses. There will be no staffed service. There will be scheduled maintenance on Emerald’s research platform, Emerald Insight, which is scheduled to take place on Tuesday 22 March 2016, beginning at 08:00 - lasting for up to 12 hours. On Sunday March 13, 2016, ProQuest will be installing critical firmware updates to its systems infrastructure. 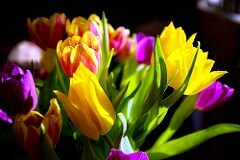 The window is scheduled to begin at 03:00 GMT and will last for eight (8) hours. ProQuest apologize for the short notice of this maintenance window and for any inconvenience this will cause NUIG users. This exhibition aims to highlight the possibilities of women’s history and to recognise the effort of past students of the university through an exhibition of their publications held in the library. This group of women was among the first to enter university in the decades after 1879, the year that university education was legally open to women. 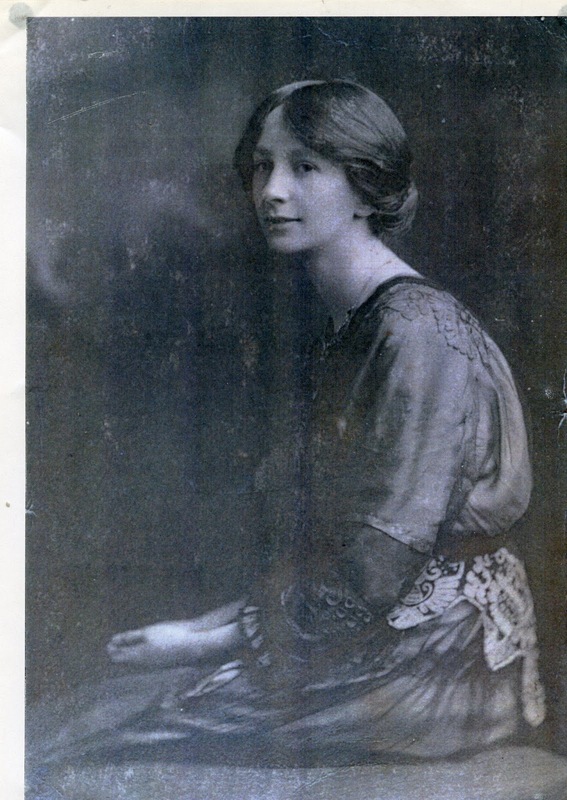 The first woman student to sit for a degree in Galway, Bessie Anderson, graduated in 1888. The majority of the women students of this era won academic scholarships and prizes, undertook postgraduate studies in Ireland and Europe, were active in various social, political and feminist organisations and achieved prominence within their fields, nationally and internationally. The exhibition is a project of The Centre for Global Women’s Studies, School of Political Science and Sociology; Art and Archives in the West of Ireland and Explore, in association with Special Collections, NUI, Galway. The Exhibition is part of a larger forthcoming research project. Exhibition research: Mary Clancy. Library Research: Marie Boran. Library Exhibition Assistance: Kathleen Burke. Student Exhibition Assistance: Nuala Gaffney. Acknowledgements: Gillian Browne, Anne Byrne, Kat Castillo, Caitríona Clear, Ray Conlon, Frank D’Arcy, Margo Donohue, Erin Grant, Kieran Hoare, Margaret Hughes, Mary McGill, Niamh Reilly, Amber Walsh-Olesen. Today marks the 50th anniversary of the bombing of Nelson's Pillar on Dublin's O'Connell Street in 1966. Despite the historic and often controversial opinion in which the statue was held, the end and fate of Nelson and his pillar could, perhaps, not have been predicted or foreseen. 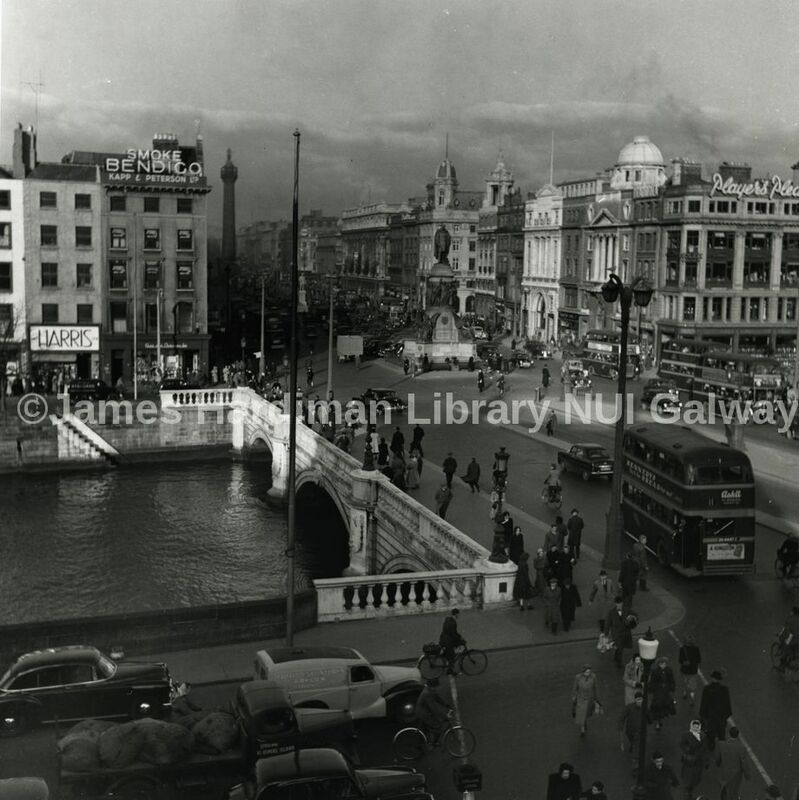 On this anniversary, it is timely to look back into the archives of this period and see just how this statue dominated the streetscape and skyline of Dublin's O'Connell Street. By virtue of its location the pillar was a witness to some of the most significant events in Irish history, as well as to the development of the main thoroughfare of Ireland's capital city. 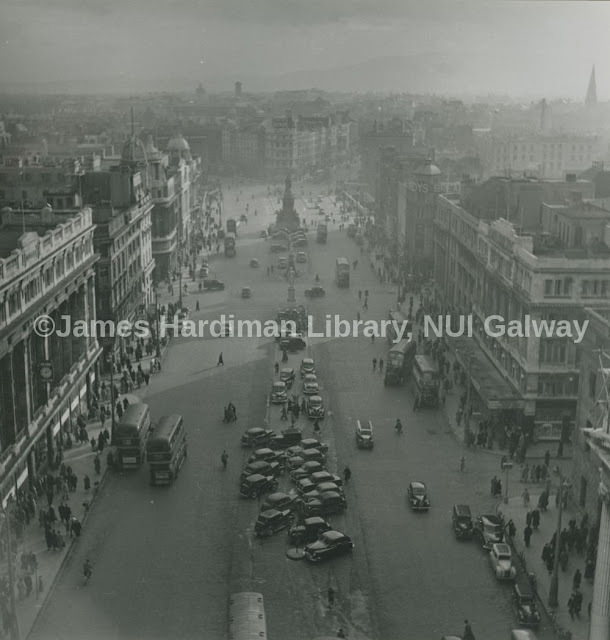 These images are from the Ritchie-Pickow archive within the Hardiman Library of NUI Galway. Taken by American photographer George Pickow when he and his wife, the famous American folk-singer, Jean Ritchie, came to Ireland in 1952-53. Jean received a full-bright scholarship to come to Ireland and immerse herself in the folk song tradition and culture of Ireland and collected songs from many leading Irish singers and musicians, especially in the west of Ireland. The couple also travelled through Dublin and took many incredible images of a Dublin that is long removed from our own recognition. George was able to take photographs from atop of Nelson's Pillar and this offers a viewpoint through Pickow's own lens but also of a vantage point of Dublin city that disappeared as quickly as the pillar itself. 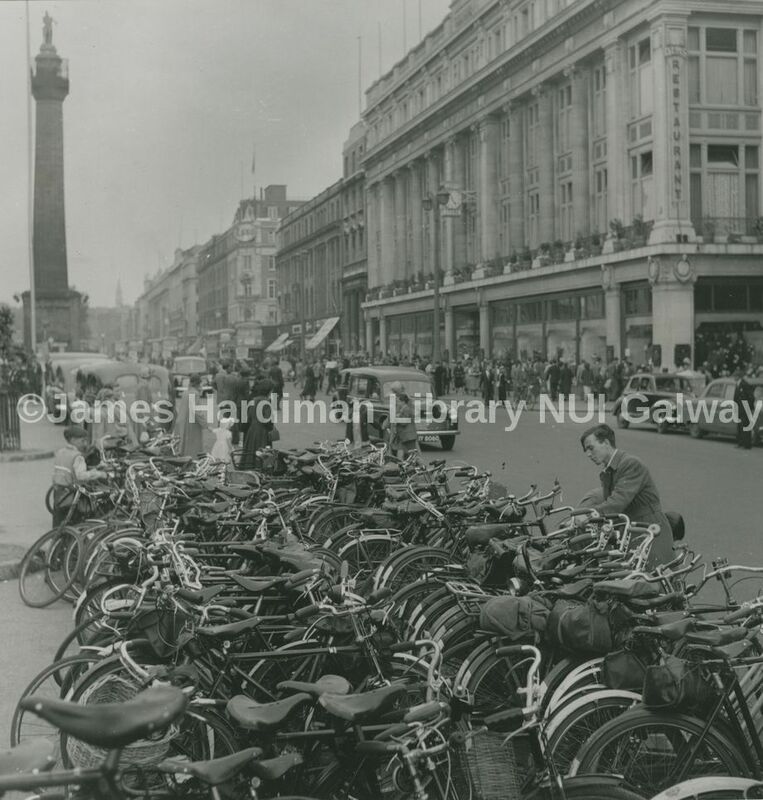 Other images are also available images from the Ritchie-Pickow archive at the Hardiman Library, NUI Galway. AWC tutors will hold two workshops over the next few days. The first workshop will take place on Friday, 11 March 2016, at 5 and is entitled 'How to Plan, Structure and Write an Essay'. The second workshop will take place on Monday, 14 March 2016, at 4pm and is entitled 'The Complete Essay Writing Process'. Anyone who has an essay to write should find these workshops useful. Bob Green from Thomson Reuters (EndNote.com) will provide a training session on EndNote for Mac users next Wednesday 9 March from 2 to 4 pm. See http://www.eventbrite.ie/e/introduction-to-using-endnote-for-mac-users-tickets-22464861004 for details and booking link. Space is limited and booking is essential. Access to Informa Healthcare content is down at the moment. We are working with the publisher to restore this access as soon as possible. We are conducting our annual LibQUAL+ Library survey - Check your email for the survey link. Your responses will be of great value in allowing us to benchmark ourselves against similar libraries and to help us prioritise service improvement initiatives. When you complete the web survey you may choose to submit your name to a draw for an Apple Ipad Mini 4 with 4G. Monday, March 7, 2:00 pm, in the main floor Library Training Room. 3. How to use Endnote Web's collaborative tools.